We have some of the lowest prices on diabetic lancets and lancing devices anywhere. View our low prices on Lancets. Shield HealthCare supplies name brand diabetic blood glucose test strips. Low prices on Test Strips from Accu-Chek™, Lifescan®. Stay on top of your diabetic testing schedule with the quality and reliability of top name brand meters. 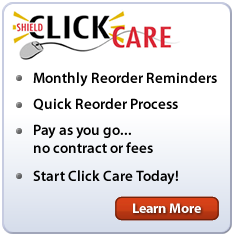 Reduced prices on Meters from Accu-Chek™, Lifescan®. Full line of discounted Test Strips here. View all of our meters here.